Mint and Honey has provided me with Maison de la Chicoutai’s Cloudberry Herbal Tea for the purposes of providing an honest review. Cloudberry Herbal Tea came to me in this cute tin with some lovely floral artwork on it – I love all things floral these days, it just makes for a more cheerful moment. There’s some information printed on the side of the tin about cloudberry about where it’s found (Minganie in Quebec) and its history. The name of this berry in French is Chicoutai, which means fire – for the colour of the berry. Traditionally, cloudberry is used to help with coughs, fever, and lung ailments. This fruit is high in vitamin C and was important for helping to prevent scurvy, back in the day. 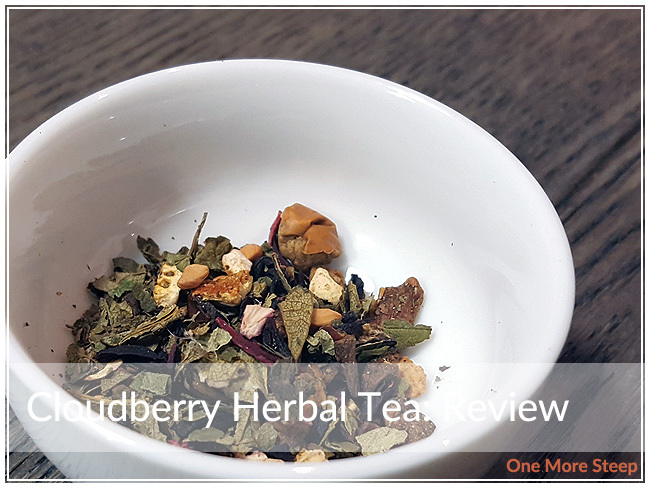 Cloudberry Herbal Tea consists of cloudberry leaves, hibiscus flowers, apple granules, rosehips, berries, roasted chicory root, orange peel, natural flavours, and orange peel. Cloudberry Herbal Tea came preportioned into pyramid sachets, so I just popped one into my teacup for steeping. 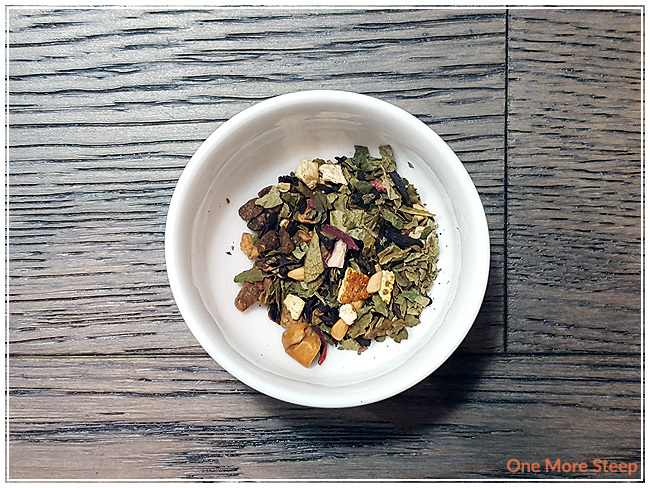 This herbal blend has an amazingly sweet, fruity aroma to it. There’s a lot of berry aromas in there. I’ve never had the opportunity to taste cloudberry before, so I couldn’t tell you if that’s what I smell from the sachet or if it’s one of the other fruity ingredients (but it sure smells good!). Maison de la Chicoutai recommends steeping Cloudberry Herbal Tea in boiling water (100°C/212°F) for 3 to 5 minutes, and suggests sweetening it with honey if sweetener is needed. I opted to do my initial steep of Cloudberry Herbal Tea for 4 minutes. Cloudberry Herbal Tea steeps to a beautiful scarlet red, I’m not sure how much of that is from the hibiscus and how much is from the other ingredients. It’s such a lovely colour. I found that the aroma is quite fruity – I can smell berries for sure. 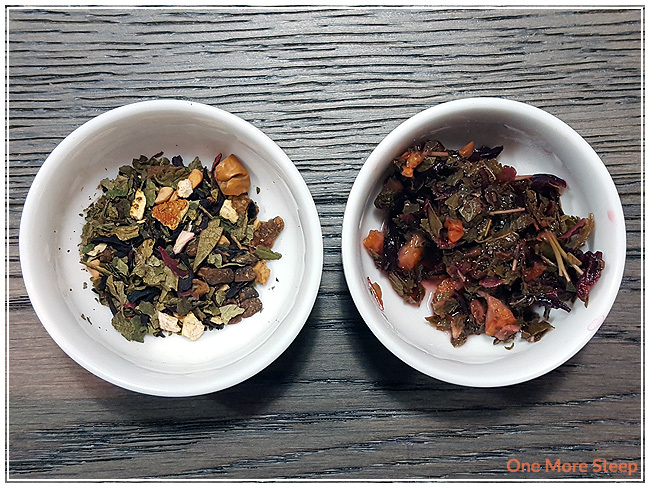 The taste of this tisane is sweet, fruit, and tart. 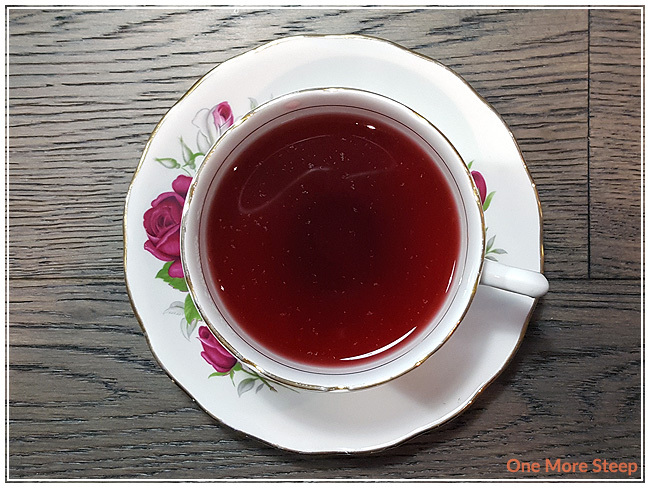 I’ve found in the past that blends with hibiscus can be a touch too tart, but I don’t find that to be the case with Cloudberry Herbal Tea. It causes just enough mouthpucker to let you know that it’s tart, but it’s balanced out by the sweetness from all the fruit ingredients. I found there to be just enough sweetness from the ingredients that I didn’t need to add any honey to my cup. I resteeped Cloudberry Herbal Tea once, for a total of 6 minutes, and found it to be wonderfully fruity. The colouring wasn’t as intense as the initial steep, and the tartness was considerably less in comparison. The second steep is more fruity and sweet and reminded me of a fruit punch. 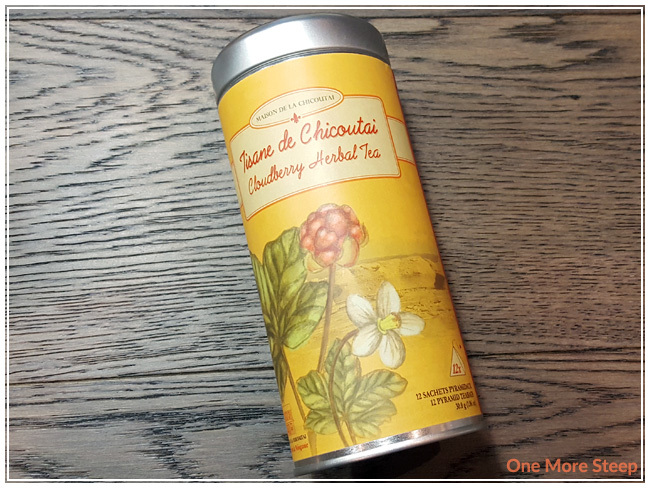 I loved Maison de la Chicoutai’s Cloudberry Herbal Tea. I’m so glad that Honey and Mint decided to send this one to me! The flavours in both the initial steep and resteep were enjoyable. If you’re not fond of tart, I’d would recommend adding some honey to temper the hibiscus a bit. I think that this would be wonderful iced, the berry flavours would do well as part of an iced tea (or mixed with some soda water). I would recommend resteeping it, because having an herbal tisane that tastes like fruit punch is a wonderful summery treat.